Lynn Nottage does a great job with writing sympathetic characters, and it’s clear she’s done passionate research. Nottage surprisingly is the first woman in history to win two Pulitzers for drama. She crafts characterization through comedy and vulnerability and then forces the audience to watch the downfall of every character on stage. In a way, we are empathetic to each character in Sweat because they reflect us. We as humans are scared. We like to place the blame. We rebel and then are broken again and again. This inward reflection is also due to the work of every single electric and vulnerable actor presented onstage (Tyla Abercrumbie, Steve Casillas, Mike Cherry, Ronald L. Conner, Chaon Cross, Kristen Fitzgerald, Keith Kupferer, Edgar Miguel Sanchez, Andre Teamer). This show is so driven by stakes and choices that it is impossible not to gasp and inwardly scream about the choices made. Not to mention that both acts of the story end with a bang that is so prophetic it will leave audiences haunted for weeks. It’s not just the fabulous directing and acting that make this play stand out. It’s also directed by Ron OJ Parson, who makes every movement and action in this story feel critical. It’s clear to see that Parson is as masterful a director as Nottage is a writer, and just like Nottage he doesn’t give audiences all the answers, leaving us to ponder the show as we leave the theatre. The gorgeous and impressive prop-laden set (Kevin Depinet, Alice Maguire and the prop team), along with the circa 2000s costumes (Mara Blumenfeld) skillfully draw in the audience. I marveled at the working television onstage, all the “alcohol”, and other unique set characteristics that told its own story about the period of the show. The actors also effortlessly move around the set through staging, and the sound transitions (Richard Woodbury) with such familiarity that it’s hard to not be sucked into the story Nottage writes. 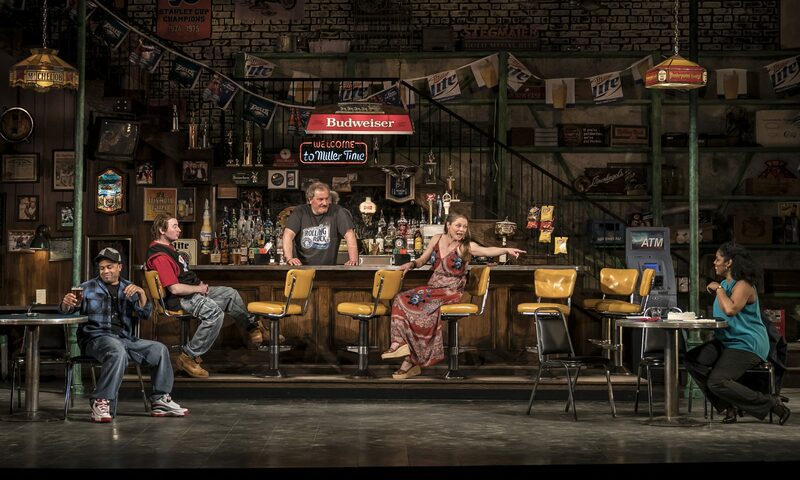 Sweat can be done in any staging because it’s relevant in its themes and rich writing, but this production is a insightful and engaging representation of what this story can do. This story is about the crimes we all witness. It’s about working in America when nothing is being made in America. It’s about the unattainable “American dream” we try to possess. While I don’t think everyone will agree with some statements this play makes, as nothing Nottage writes is an easy conversation about race and politics in America, its setup and payoff is absolutely striking. If there’s any show you need to rush and see at The Goodman, it’s Sweat.